This week’s interest rate spike caught a lot of people off guard, including the folks at the Congressional Budget Office (CBO). 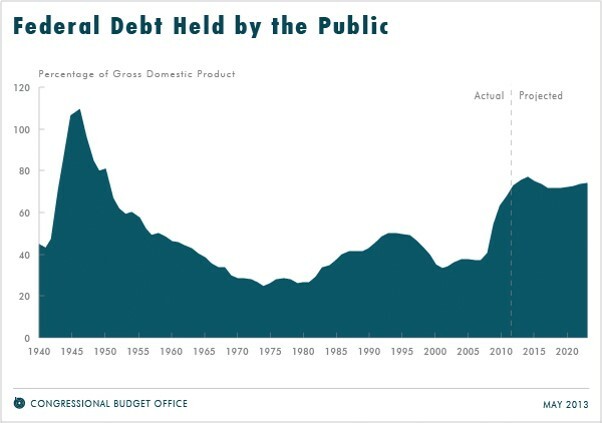 The latest (May) federal debt projections from the CBO show a leveling off of debt to about 75 percent of GDP for the next 10 years. Prior to this week, there was at least one reason to doubt this rosy scenario. Namely, CBO reports a higher than previously thought increase in income at the end of last year, as taxpayers tried to avoid the higher tax rates of this year. This led to a one-time boost in tax payments, which makes sense. But CBO is projecting this boost will continue this year and for the next 10 years. Seems overly optimistic. This week’s interest rate spike adds another reason to doubt the rosy scenario. The CBO had been expecting the 10 year Treasury note rate to remain below 2.5 percent for the remainder of the year and into the 2nd quarter of 2014. Oops. The 10 year T-note has been trading above that level most of this week. 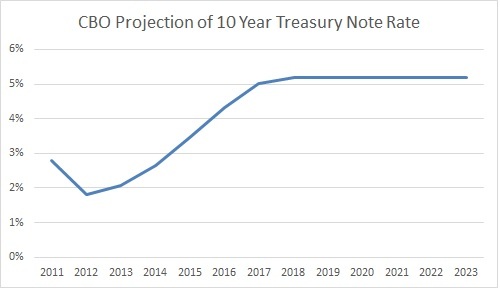 CBO does project the T-note rate to increase over the next 10 years, just not quite this fast. 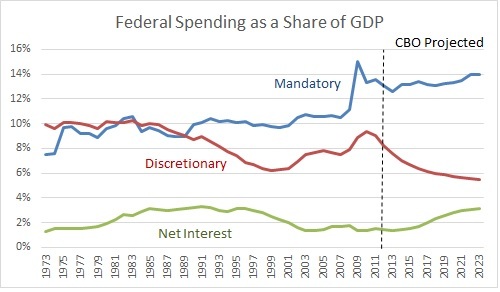 As a result, CBO projects federal interest payments to remain low for the next couple of years before climbing to about 3.2 percent of GDP by 2023. If interest rates continue their ascent we’ll see interest payments approaching the 3.2 percent level much sooner. While 3.2 percent of GDP may not sound like much, it is the sort of debt pain that brings a lot of people to the table. The last time it happened we got Ross Perot running the most successful third party campaign since Theodore Roosevelt, and then both Republicans and Democrats agreeing to reduce the debt considerably over the 1990s.